Check out Tobi's Subtle And Sweet Dress Color blocking gets cool in the Black & Cobalt Subtle And Sweet Dress. A flippy slip dress with spaghetti straps and v neckline, this two tone midi dress has contrast panels at the neckline to add a touch of sass. With heels or booties, this strappy dress is a brunch to bar fave. 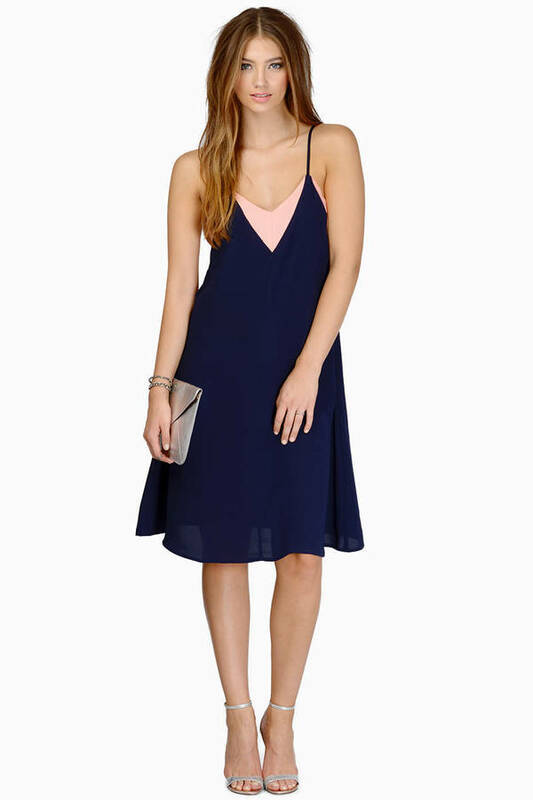 Color blocking gets cool in the Navy & Blush Subtle And Sweet Dress. A flippy slip dress with spaghetti straps and v neckline, this two tone midi dress has contrast panels at the neckline to add a touch of sass. With heels or booties, this strappy dress is a brunch to bar fave. Color blocking gets cool in the Black & Cobalt Subtle And Sweet Dress. A flippy slip dress with spaghetti straps and v neckline, this two tone midi dress has contrast panels at the neckline to add a touch of sass. With heels or booties, this strappy dress is a brunch to bar fave. Measured on a size Medium.